Intro: Who is Quarry Hill Advisors? Choosing a financial advisor isn’t an easy process, but it’s always a good idea to be cautious about those who lend financial advice. To create a successful financial plan, an advisor needs to be up-to-date on current industry trends, have a keen eye for detail, and be invested in providing personalized, thoughtful services. Just as no two investors will have the same portfolio, no two advisors will have the same approach. Before selecting a financial advisor, it’s important to understand not only how they are qualified, but also what services they offer, and what approach they use to tailor those services to each client. For those seeking financial advisory services in Minnesota, Quarry Hill Advisors is poised to become one of the top firms in the St. Paul area. Quarry Hill is both a new advisory firm and a small one—it is solely owned and operated by its founder Kyle Moore. Founded in March 2017 and backed by strong financial strategies, Quarry Hill Advisors is in the beginning stages of what could become a very promising career in the financial advisory industry. As a Certified Financial Planner, founder Kyle Moore takes on fiduciary responsibilities for each client. Advisory firms that take on fiduciary responsibility have a fundamental obligation to provide thorough financial advice while acting in their clients’ best interests. As a fee-only firm, clients can rest assured that all financial advisement from Quarry Hill comes without incentive for personal gain. This means that the firm does not receive commissions for selling life insurance or mutual funds, ensuring that clients receive unbiased advice through every step. With a fiduciary responsibility and a fee-only payment structure, Quarry Hill is committed to providing the transparency and ethical foundation to build fundamental trust between themselves and their clients. 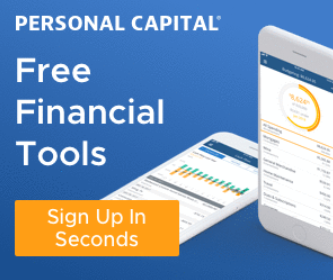 No two people have the same financial goals and values—and Quarry Hill has adapted a client-based approach to address the unique complexities of personal financial planning. Get Acquainted—First, a complimentary meeting or phone call will help client and advisors get to know each other and see if the partnership is a good fit. Get Organized—Bring any financial documents you have, and your advisor will help you get things in order. Discover—The most time-intensive step; this involves uncovering your financial goals and values to lay a foundation for a financial plan. Plan—Create and review a plan that illuminates your current financial path and what changes should be made to accomplish your goals. Implement—Your advisor will work with you to make recommendations into realities. 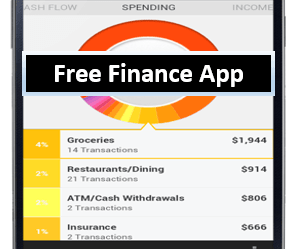 Modify—As your needs and goals change, so will your financial blueprint. As such, your plan will be consistently modified and updated as needed. This sort of client-focused approach is a great example of the benefits of working with a small advisory firm, as it often corresponds with one-on-one attention and consistency in advisement. Quarry Hill recognizes that trying to predict market fluctuations is an impossible task—and one that could ultimately hurt portfolios in the long-run. 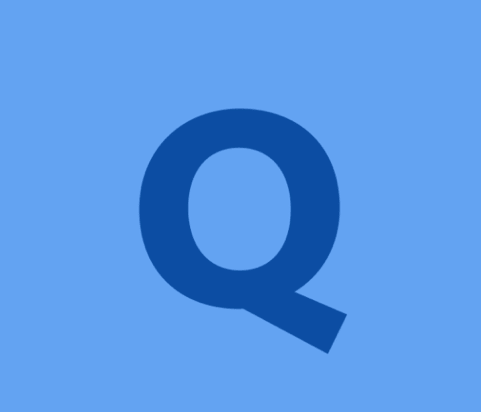 Rather than attempting to coordinate portfolios based on assumptions and predictions, all Quarry Hill portfolios are sponsored through Charles Schwab and managed with Evidence-Based Investing. For Quarry Hill evidence-based investing means deferring to decades of research from financial professionals, including Nobel Laureates. Depending on personal preference, portfolios can also be tailored to suit the needs of environmentally or socially-conscious investors, making Quarry Hill an excellent choice for socially-minded investments. Their evidence-based portfolios use ETFs, index funds, and other broad market mutual funds for low-cost, global diversification. According to their SEC Firm Brochure, Quarry Hill may supplement their investment advisory process by participating in the Schwab Advisor services program offered to independent financial advisors. As a fee-only financial advisor, Quarry Hill maintains a strong focus on providing fair pricing for all levels of service. Rather than create one blanket fee, each service comes with the acknowledgement that pricing will be based on individual needs and complexity, reinforcing a focus on providing a personal, individualized approach. Described as a plan “for do-it-yourselfers who want a professional perspective,” a one-time plan is a unique offering. Enrolling in a one-time plan is not only an affordable way to try financial advisory services, but it also makes these services accessible for even the most hesitant—or financially fluent—of clients. Pricing for a one-time plan will range between $500-$3,000 depending on the overall financial complexity. This service comes with the acknowledgement that great financial advice shouldn’t automatically come with a high price tag. WealthFuture plans require an annual retainer based on overall financial complexity. 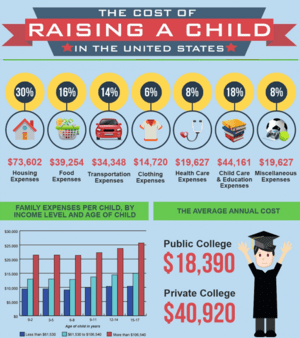 According to XY Planning Network, this fee breaks down into $100 per month. For clients planning for retirement, WealthManagement services will provide comprehensive financial planning to boost your portfolio and help you reach your financial goals. Pricing will be based on a percentage of the total assets held within the portfolio. According to XY Planning Network, this percentage is 1 percent of the total assets under management. 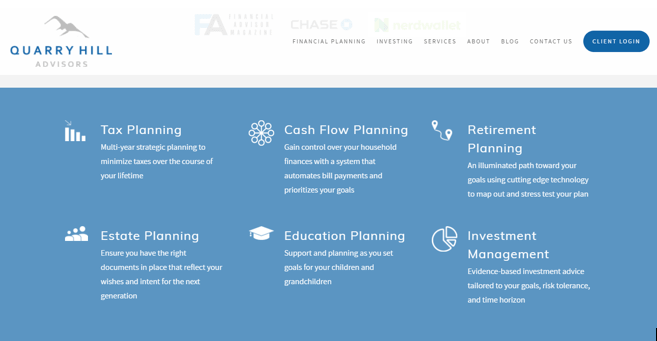 While Quarry Hill lists a wide range of specific financial services on its homepage, it is unclear as to where these services fit in with the plans listed above. Although some individual services—like retirement planning and investment management—seem to align with WealthManagement, the application of specific services is not clearly stated. As such, it may take an introductory meeting with Quarry Hill to determine whether your personal financial plan will include specific services like tax planning or cash flow planning, pictured below. For financial advisors, having the right industry affiliations is a key component to ensuring that their business practices are ethical, efficient, and up-to-date. Quarry Hill has an impressive range of industry affiliations, especially when considering that the firm is less than a year old. Three of these affiliations include Fee-Only Network, WhyFiduciary.com, and Dimensional, a global investment manager. Below, we have provided a detailed explanation of a few additional affiliations and accreditations held by Kyle Moore, founder of Quarry Hill Advisors. As a certified financial planning professional, your certification status and any disciplinary history is publicly listed, promoting transparency within the financial advisory history. Moore received his CFP® certification in 2015, and continues to maintain certification with zero disciplinary marks. 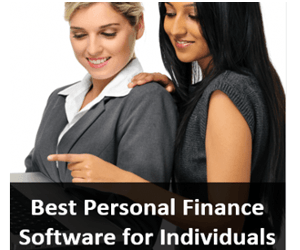 Quarry Hill is a member of the National Association of Personal Financial Advisors (NAPFA), a national association of fee-only financial advisors. Membership in NAPFA requires adherence to a Code of Ethics and an annual Fiduciary Oath, reinforcing the strong sense of value-based advisement held by the firm. Founder Kyle Moore is also part of XY Planning Network (XYPN) a professional organization of fee-only financial advisors who specialize in working with Gen X and Gen Y (Millennial) clients. At its core, XYPN offers financial advisors the unique ability to tailor their services to these generational niches. With over 10,000 moving into retirement over the next two decades, focusing on boosting Millennial finances and helping Gen Xers move towards retirement certainly makes smart business sense. Additionally, a membership with XYPN provides ongoing technology, compliance, education, and marketing support, building a strong foundation for new advisory firms. 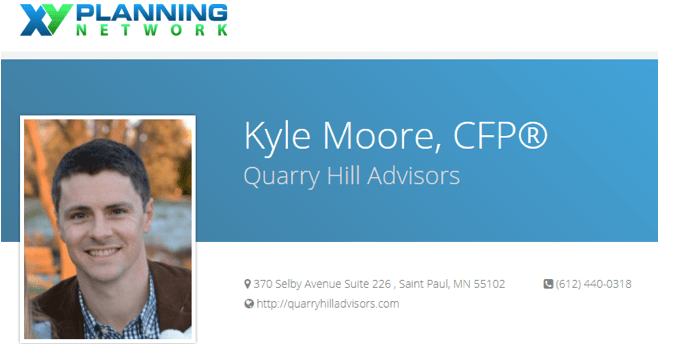 Moore’s membership in XYPN demonstrates a keen awareness of both the financial advisory industry and the evolving economy, putting Quarry Hill on track to provide in-demand, tailored services. Despite the firm’s young age, Quarry Hill Advisors has already earned a wide range of media mentions. 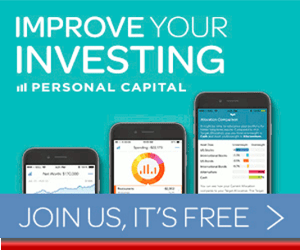 His input covers a range of financial advisory topics, including the importance of hiring a financial advisor, cost analyses on portfolio fees, diversifying a 401k, innovative financial software, and successful Millennial budgeting. Having an advisory firm that promotes client interaction is a strong indicator that the firm is committed to creating personal connections. For Quarry Hill, promoting client interaction seems to be a core part of what they do, reflected not only in their personal approach to financial planning, but also through their social media outreach and blog. Quarry Hill maintains active social media accounts on Twitter and Facebook, which is crucial for any firm hoping to capture the Millennial market. 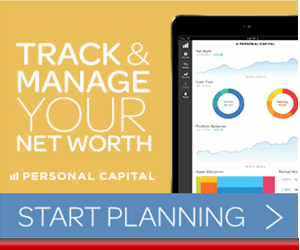 Can Capital Gains Push Me into a Higher Tax Bracket? Content on social media accounts and blog posts are all written in a friendly, welcoming tone, making it easy for clients to connect with an industry that is traditionally seen as unapproachable. How will Quarry Hill Advisors fare in the years to come, especially with only one financial advisor on staff? With less than a year of operation under its belt, forecasting the future is a near-impossible endeavor. Only time will tell when it comes to measuring success by assets under management. Because Quarry Hill Advisors is a new entity, they currently are not reporting discretionary or non-discretionary AUM. Of course, it’s worth noting that the measure of success isn’t necessarily about how much money is managed, but rather, how well it is managed. Although staff support may be tight, the insular nature of a small advisory firm often generates its own appeal. Clients are all guaranteed to establish a genuine relationship with their advisor, building trust and generating valuable, successful financial plans. Conversely, potential clients looking for a larger support staff may find working with Quarry Hill Advisors challenging. With that said, it may be best to apply the firm’s own evidence-based methodology to future success, rather than assumptions or predictions. Based on the evidence—strong professional affiliations, industry certification, and client-focused processes—Quarry Hill Advisors has plenty of potential to become a financial advisory authority for Minnesota residents.